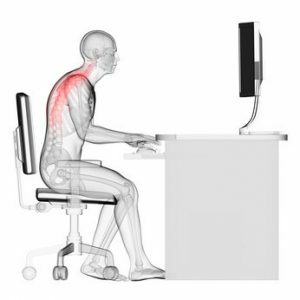 Adjust your chair height so you can use the keyboard with your wrists and forearms straight and level to the floor, this will help to reduce repetitive strain injuries. Rest your feet on the floor or on a stool if necessary, with your knees below your hips. Place your screen at eye level and approximately an arm’s length away to reduce neck strain. Keep your arms bent in an L shape with your elbows by your side when using a keyboard. Reduce sources of glare to reduce eye strain. Either adjust the positioning of your monitor or close blinds to reduce glare. Put up with sore wrists. If your wrists hurt whilst typing, try a wrist pad in front of your keyboard. If that doesn’t work don’t just grin and bear it but get proper support and advice. Hunch over… keep your bottom to the back of your chair and keep your back straight as bad posture will usually lead to back aches. Forget to take regular breaks to stretch your legs and take a break from the screen. Use the wrong glasses. Make sure that you have a suitable pair of glasses for close up work at a computer and get your eyes regularly tested. Forget to fill in the DSE Questionnaire. 10.5 If you are one of those who gets absorbed in your work, try setting diary reminders/alarms to get you up and moving on a regular basis. An alternative is to lead the way in your office by demanding that some of your meetings are ‘walking’ meetings – if it’s just you and one other who needs to talk then why not take a walk around the block instead of hunkering down in yet another chair?